“When I leave, it should look like I was never there,” says Katja van der Loo, CEO of Papyrus Home Design, a Boonton, New Jersey interior design firm. She’s describing the desired end result after a remodeling project. “Whatever style the kitchen is, if it is in keeping [with] and respectful to the architecture of the home, I think that’s when it’s most successful. This bright kitchen would look awful in a different type of house. In this house, it looks incredible,” she says.When van der Loo was hired for this project, she found a kitchen stuck in the ’80s. The older part of the home had a classic design but suffered from a poorly executed addition. The remodeled portion appeared to be tacked onto the house as an afterthought. The owners, a couple with young children, needed a fresh start. The previous construction was removed and a new three-story addition was planned for the back of the house. This kitchen was part of that project. “We had to seamlessly blend the old with the new,” says van der Loo.“I knew this client was into balance and symmetry, and that’s how I approach things too,” explains van der Loo. “The cleaner it is the better it feels, I think.” Balanced designs create a calming effect, which is helpful for any busy homeowners.The range and island are perfectly centered, as are the large glass pendant lights. 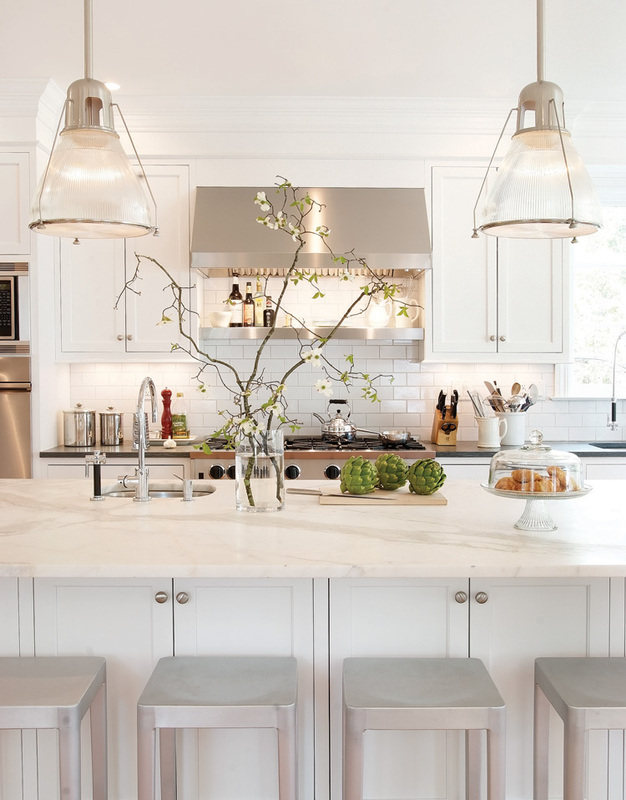 “Those pendants add an industrial touch to the kitchen,” she says. And they are grand enough to be noticed. 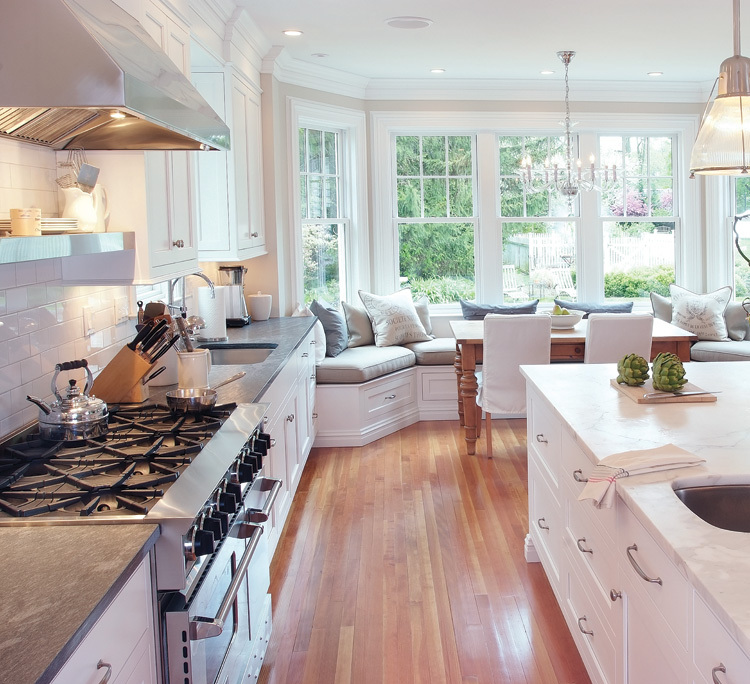 “The kitchen has nine-foot ceilings and the island is nine feet long. I felt we needed something large scale to balance all that space.”Off to the side, the bench seating that skirts the wide bay window is also perfectly symmetrical. The seat cushions are custom, while store-bought pillows in gray, white, and taupe finish the look. Drawers beneath the window seat add more storage, which the homeowner uses to keep serving pieces that are rarely used. Designer Katja van der Loo believes in keeping it classic. “Make a remodeled kitchen fit the home’s architecture and it will always feel current,” she says. Inspired by a sojourn in Paris, the homeowner requested a marble top in the kitchen—a surface prized by professional bakers.